Another quickie illustration for SciFiNow Magazine; deadline was pretty fast as I'm going away this week. 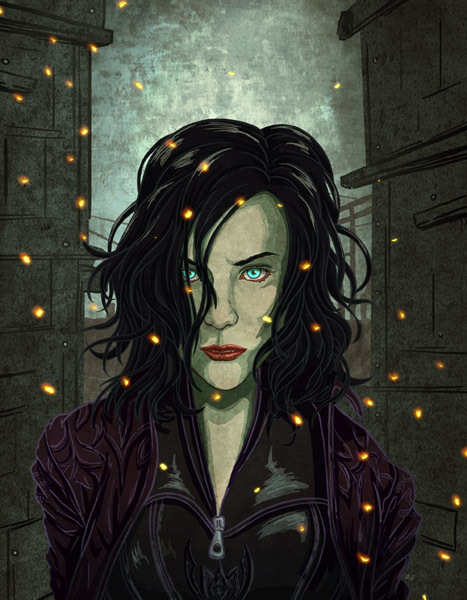 This one was for the new Underworld: Awakening film that's coming out, so it depicts Kate Beckinsale! I'll be honest, this was frustrating as hell because Kate Beckinsale appears to look somewhat different in nearly every scene or photo of the Underworld movies. Seriously. Super challenging; I sketched her face out about 6 times until remotely coming close to a likeness. Half the time her eyes are an icy blue when she goes all-Vampire-crazy, the other half is her natural eye color, so it really changed her face for me! !